This Mages Guild is the Vulkhel Guard branch of the Mages Guild. The guildhall is located in the western part of the city. It is a spacious two-story Altmer-style building. Some of the Guild Savants can be encountered right outside, resting or practicing spell casting. The front door leads to a small foyer with two cabinets. 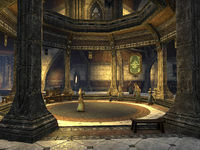 Further in is the circular main hall utilized by Fairwen for reading lectures which are attended by Guild Savants. The magister and vendors of magical supplies also reside on this floor. Across the hall, an alchemy station can be found on the left while an enchanting station is on the right, both available for crafting. A book, Subtropical Cyrodiil: A Speculation, lies on one of the benches. To the left from the entrance is a small appendix with two doors to the upstairs area. Bravynor can be found here. Another appendix on the right-hand side of the ground floor houses Angrel and Demeepa. There are two more doors leading upstairs here. Three more Guild Savants can be encountered on the top floor of the guildhall. This part of the premises is furnished as a reading area with tables, chairs and benches. This library in this branch is quite extensive, having sixteen bookshelves, thus there is a good chance to read several skill books here. A journal, Aluvus' Journal, lies on one of the tables. It adds a map marker to the Ondil ruin. A book, The Fall of Carac Dena, can be found next to it. A note, Entila's Folly, lies on a table in the eastern end of the hall, near a door which leads to one of the balconies. There are three accessible balconies on this floor, although excluding a spectacular view, they hold nothing of significance. All the items and storage containers in the guildhall are owned except for the cupboards in the foyer. 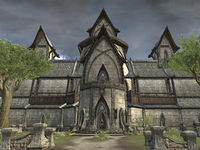 This guildhall serves as a good starting point for anyone interested in joining the Guild or for obtaining provisioning, alchemy, and enchanting crafting certifications. Many Guild Savants can be found on the premises as well. * This person only appears here before the quest Simply Misplaced.